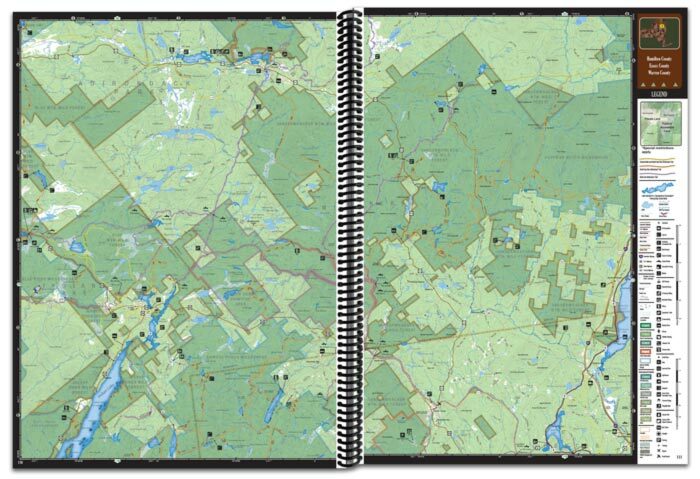 These 176 to 192 page, 15.5x11", spiral-bound All-Outdoors Atlas & Field Guides are created at twice the scale of other road atlases, which means double the detail. And while the maps are sure to be the finest quality you have ever used, the thing that makes these books unique is all the additional information. 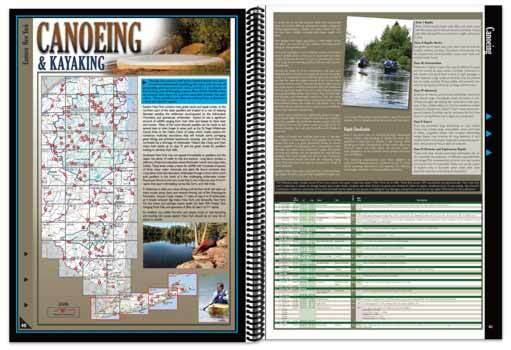 Your favorite outdoor activities including fishing, hunting, camping, hiking, biking, off-roading, paddling, skiing, golfing, wildlife viewing, and more are covered in great depth with helpful editorial and extensive tables, which are all cross-referenced and indexed to the map pages in a way that's fun and easy to use. Whether you're planning an afternoon bike ride or an extended camping trip, these atlases are built to help you take advantage of the extraorinarily diverse and numerous opportunities for outdoor enthusiasts across the state. Each map page presents a highly detailed view of individual sections of New York in rich, full color. A full legend, coordinates, and easy-to-read symbols tied to informative tables make it a snap to find the locations and facilities to enjoy your favorite outdoor activities. 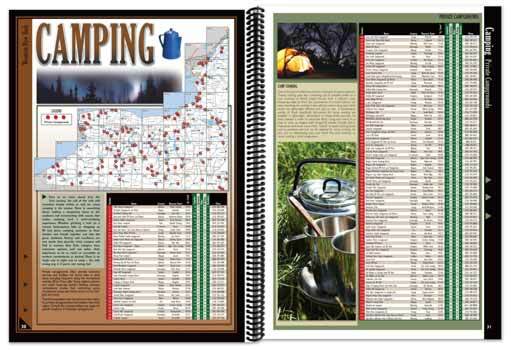 All-Outdoors Atlas & Field Guides include information on ALL of New York's campgrounds, public and private, from primitive to RV sites, complete with comprehensive tables for each, cross referenced back to the detailed map pages. 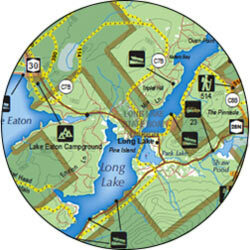 Other tables and detailed maps for all of New York's public campgrounds with information on amenities are also included for state parks, county parks, state forests, national forests, remote sites and more! If you're a camper, you won't find a more accurate and comprehensive source for ALL of your camping options. Designated and other New York canoeing and kayaking rivers are highlighted in your All-Outdoors Atlas & Field Guides with maps that feature access, rapids dams, portages, shelters, campsites and other information! 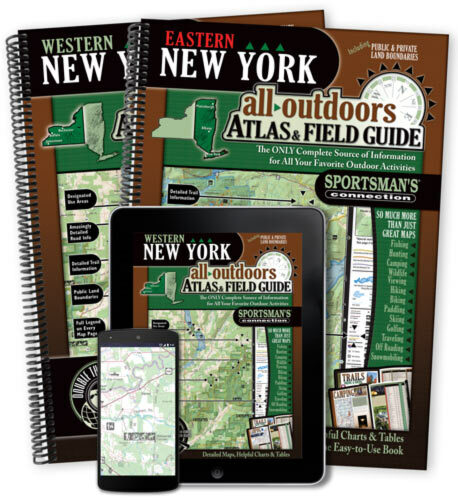 All-Outdoors Atlas & Field Guides include extensive how-to, when-to and where-to information covering New York's great fishing opportunities, whether you’re after game fish - walleye, northern pike, musky, largemouth bass, smallmouth bass, catfish, or panfish - crappie, bluegill, perch, or white bass. Fishing information is also included to help you locate and catch lake trout, brown trout, brook trout, rainbow trout, splake, chinook salmon, coho salmon with extensive tables on virtually every publicly assessable lake in the state as featured in the Sportsman's Connection Fishing Map Guides - your perfect companion to the All-Outdoors Atlas. Each table is cross-referenced back to the map pages that are TWICE the scale of other state atlases! Your All-Outdoors Atlas & Field Guides include New York river and stream fishing information with maps and tables on trout fishing opportunities throughout the state. 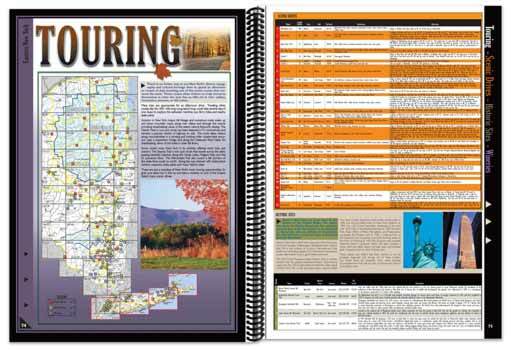 All trout streams, stocked and wild, are highlighted on each map page. 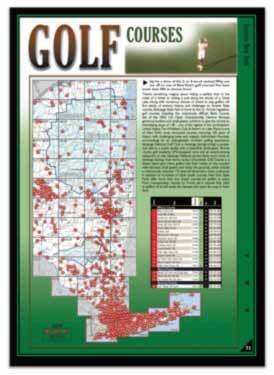 Through tables and overview maps cross referenced to map pages at twice the scale of other state atlases, identification and location of New York's golf courses is made easy through your All-Outdoors Atlas & Field Guides. 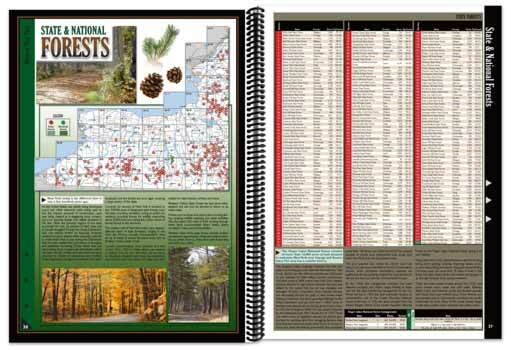 Your All-Outdoors Atlas & Field Guides include extensive how-to, when-to and where-to information covering New York's great hunting opportunities, whether you're after big game such as deer or bear, upland game such as grouse, pheasant or woodcock, waterfowl - ducks and geese - or other small game. 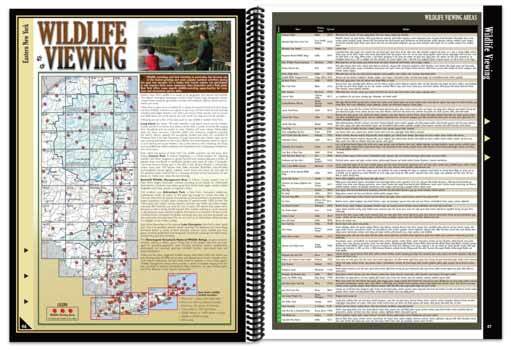 Informational tables are included for wildlife management areas with species presence, cover type, size, location and tips cross-referenced back to detailed maps at twice the scale of other atlases. 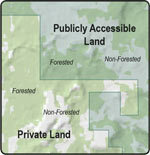 All this plus other public land information make this a hunting atlas like no other! All New York state and national forests are featured in your All-Outdoors Atlas & Field Guides, including information on trails, campgrounds and recreational sites. New York's extensive cross-country ski trails and downhill ski sites are identified in detail in your All-Outdoors Atlas & Field Guides through tables and overview maps that cross-reference back to the map pages that are twice the scale and double the detail of other atlases. New York's State Parks are covered in detail in your All-Outdoors Atlas & Field Guides through maps and tables detailing each park and its amenities, including opportunities for camping, fishing, hiking, cross-country skiing, snowshoeing, picnicking and more! One of the best ways to take in the great outdoors is hiking, biking, skiing or horseback riding the extensive trail systems that New York has to offer. 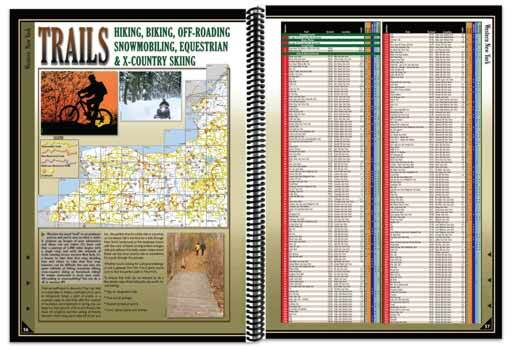 Your All-Outdoors Atlas & Field Guides detail virtually every trail in the area - from popular state trails to local and regional trail systems. The trails section calls out suggested trails cross-referenced back to the detailed map pages at twice the scale of other state atlases. Other sections of the All-Outdoors Atlas & Field Guides include additional trail information within our many parks and forests. 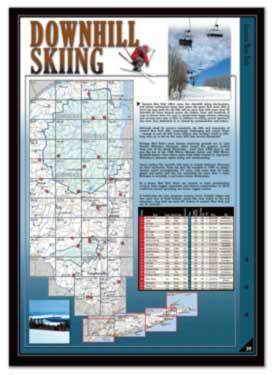 New York boasts some of the most extensive and developed networks of snowmobile and ATV trails in the nation. Each All-Outdoors Atlas & Field Guide features these trails in tables and maps that are the most detailed and complete that you can find anywhere! At over twice the scale of other state atlases, the detail is unmatched! With diverse topography and a rich cultural heritage, there is no better way to see the scenic beauty of New York than to get off the main highway and travel some small backcountry roads. Whether you want to visit one of New York's many historic sites, covered bridges, wineries and waterfalls, or take a scenic drive, your All-Outdoors Atlas will help you get there through extensive tables cross-referenced with detailed maps. New York abounds with wildlife! Whether you'e a serious bird watcher or just enjoy viewing wildlife whenever you have the opportunity to get outdoors, your All-Outdoors Atlas & Field Guides provide information and pictures on our area's mammals and birds including some of the better viewing areas, cross-referenced to the detailed map pages at twice the scale of other state atlases!